#1 Beethoven 9th over #16 Mozart 40 – Well, duh. #8 Ein Heldenleben over #9 Gounod, Faust – Faust is a great opera, but Strauss’ Ein Heldenleben is just awesome. #4 Symphonie Fantastique over #13 Carmen – Ripped from the headlines, you have drugs, murder, and demons. Berlioz all the way. #2 American in Paris over #15 Shostakovitch 10 – Dmitri’s great symphony was probably way under-seeded, but still falls to Gershwin’s toe-tapping symphonic work. #10 La Traviata over #7 Bruckner 7 – The only upset in this bracket. Despite Bruckner’s greatest symphony, Verdi (Joe Green) is the master at opera. #3 Brahms 4th over #14 Faure Requiem – I listened to the Faure several times this week, and while it’s beautiful, Brahms’ “Symphony about Nothing” is the clear winner here. #6 Prokofiev “Classical” over #11 Milhaud Cow Piece – OK, maybe that’s a little harsh, but Le Beouf sur le Toit just doesn’t hold up to Prokofiev’s masterful “Classical” symphony. While there are no huge upsets here, this bracket seems to be one that will hold serve all the way to the end. Or will it…? 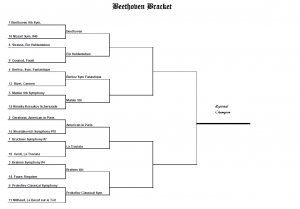 Seems like we didn’t have much in the way of upsets in the Beethoven Bracket. 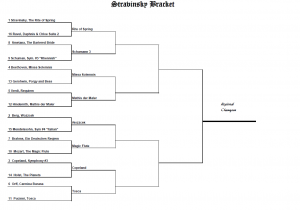 Well, let’s see what happens when we update the Stravinsky Bracket, shall we? 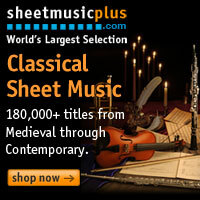 #1 Rite of Spring over #16 Daphnis and Chloe Suite 2 – Again, duh. #9 Schumann 3rd Symphony over #8 Smetena Bartered Bride – Here is a mild upset. Schumann poured his (bat-poop crazy) soul into his 3rd symphony and it deserves this win. #4 Missa Solemnis over #13 Porgy and Bess – It’s always tough to put Gershwin’s greatest work into the loser column, but too many people see Ludwig’s great mass as his best effort. #12Mathis der Maler over #5 Verdi Requiem – Typical of the NCAA Tournament, a 12-seed usually wins in the first round. Let’s give some love to the 20th century here, yes? #2 Berg, Wozzcek over #15 Mendelssohn “Italian” Symphony – I love ‘ol Felix as much as the next guy, but Wozzcek is just too important not to win here. #10 Magic Flute over #7 Brahms Requiem – This was a tough one, but ultimately, Mozart’s great, late, and beloved opera wins the day. #11 Puccini, Tosca over #6 Carmina Burana – Another huge upset in this bracket. I love Orff’s great choral work, but I think I love Tosca more. These results set up some interesting match-ups in the second round. We have a terrific match-up in Mahler 9 vs. the Symphonie Fantastique. In the Stravinsky Bracket we have Wozzcek vs. The Magic Flute – arguably the two greatest operas of their times battling it out in the second round. Stay tuned for the other two brackets tomorrow or Saturday. We’re in for a wild ride, folks!